Titan Comics: SPRINGHEELED JACK Review #bestbritcomics | Warped Factor - Words in the Key of Geek. A Victorian fever-dream involving alien invasions, infestation, mystery, missing women, royal intrigue, potions, a struggle between sanity and madness, and a desperate search for a lost love. That’s a lot for one story, but Springheeled Jack crams it all in. This offering won an Eagle Award for ‘Favourite Black and White (UK) Comic’ and the reader quickly sees why upon opening. Starting with extracts from the diary of Sir Jack Rackham, the sole benefactor of Bethlehem Lunatic Asylum, the reader is instantly transported to a new and obviously dark reality. 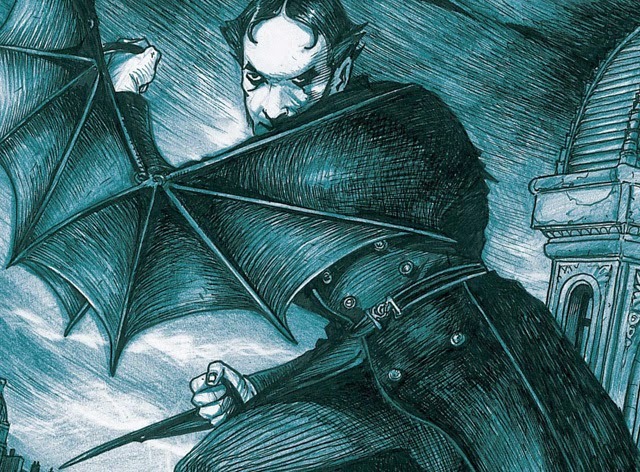 From this first page we see the nightmare creatures that stalk the night, terrorising London. Then we glimpse Jack’s own nightmare, the dread memory of losing his Evelina. He is a man tortured by memories of helplessness, and desperate to redress the balance. As London cowers in fear of the night, it seems even the Royal Family is not immune to nightmares, and poor Albert does suffer so. It's a strange suffering that Henry Jekyll takes one look at and understands the implications of it for the wider population. When Jekyll rushes to his friend Jack, we see more of Jack’s obsession and the lengths he is going to. The things he is willing to risk. From there on the story twists in unexpected ways, leading the reader to ask if Jack should be using the services of Bethlehem Asylum rather than just paying for them. This story echoes many a well know tale, and it does so with flair. The references are there for those that see them, but done to suit the storyline, and with a subtly that means if you don’t get the reference, it isn’t in the way of seeing the story. The artistic style of this is unusual and compelling. 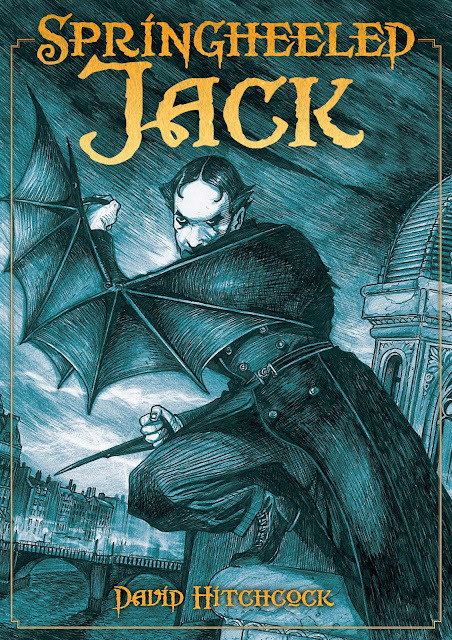 Some might mourn the lack of colour, but for me Springheeled Jack was enhanced by the monochrome. I was particularly taken with the way that David Hitchcock sets out the rooftop scenes and the design of the critters. Oh and the gestation sacks in the steeple are worth looking out for. The admission this brings forth about not knowing the female anatomy is more telling than perhaps it should be. The thing that spoils this for me, is that Jack is searching for Evelina. Sounds fair so far, only she was taken by the things Jack is hunting and it quickly becomes obvious that they aren’t taking prisoners, so why hasn’t he figured out that she’s already dead? (I have no evidence of this other than the whole not taking prisoners point of view.) I could get on board if he were just out for revenge, but the apparent self-deception of looking for Evelina, that just makes no sense. With a good story, good artwork I can see why this won an award. It gets a four out of five from me - looking for Evelina cost him the five.